As i’ve mentioned in previous posts such as Leverage and Debt Driving Real estate prices, much of our housing woes are a direct result of risky banking practices. I find it amazing that people are somehow surprised that home prices are rising because banks are lending more and more money. The bigger the mortgage the bigger the home you can buy. And yes mortgages are getting bigger, much bigger. 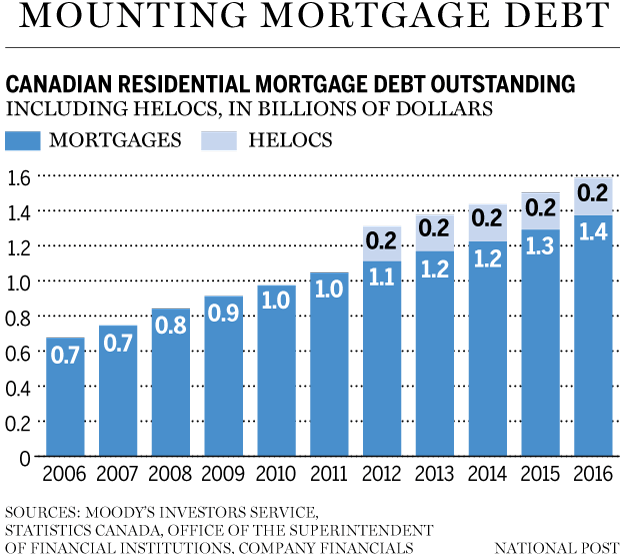 Canadian mortgages now topple 1.4 trillion dollars (not billions despite the picture below), while coincidentally Vancouver prices have soared, ranking as the least affordable city out of the 40 largest Canadian cities and a multiple of 11.8 times median household income required to buy a home. Banks, such as TD, have been exposed for breaking the law and upselling customers for products that can put them into debt. Longtime employees say their jobs have become similar to that of the stereotypical used car salesman, as they’re pushed to upsell customers to reach revenue targets. 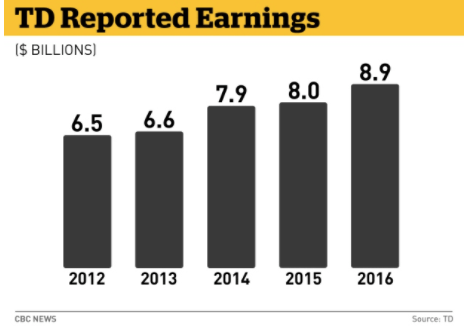 They say there has always been a sales component to the job, but the demand to meet “unrealistic” quarterly goals has intensified in recent years as profits from low interest rates have dropped. So they push bigger and bigger mortgages. Increasing household debt levels and real estate prices to new record highs. Knowing full well that CMHC aka taxpayers will heed most of the risk, their revenues soar. Of course this risky environment has prompted financial institutions to warn of a potential financial crisis in Canada should interest rates rise 2.5%. Hence wild Bill Morneau’s idea to introduce risk sharing with the banks. The banks would be required to foot a deductible should someone default on their mortgage. Of course, the cost of such a deductible will ultimately be funnelled back to the end consumer, estimated between 10-50 basis points. But if it means saving the entire Canadian economy perhaps it’s worth it. Just don’t expect the banks to go down quietly.